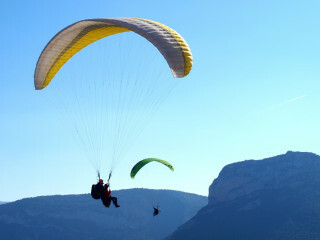 We are located in the Pyrenees, so our customers need to come in their own vehicle or rent a car. The 1hr 45min drive is worth the amazing setup in which you will fly. You will receive the location details after booking. 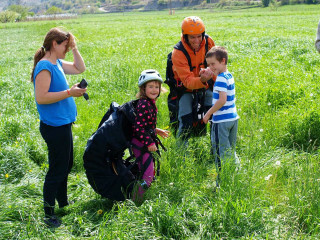 Small kids (3+) can fly with their parents and share this amazing experience. But for all people below 18, we require signed permission by their parents. Fly time is 20 minutes. 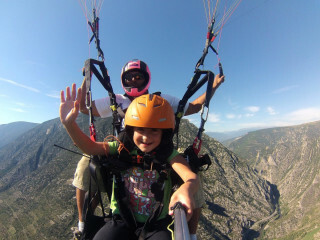 If you'd like to add to the flying experience, you can add an acrobatic maneuver or two to really amp up the adventure. On request, we can create an HD video for a slight extra cost. 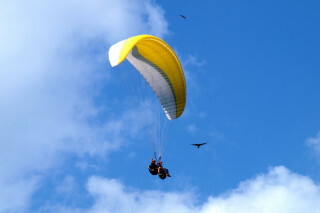 Usually, we have courses in the morning while tandem flights take place in the afternoon. Please let us know what time would fit you best in case you have any special requirements. If you cancel 2 days before the activity or more, you will receive a full refund. For later cancellations, there is no refund. In rare cases, it may be necessary to cancel or postpone the activity due to bad weather. In such cases, we will agree on an alternative date or give you a full refund. Have you ever soared freely in the air with the birds and clouds? 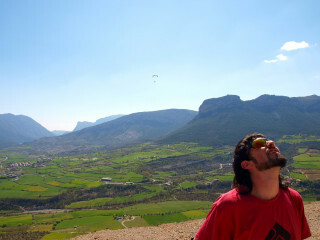 If not, this tandem paragliding adventure over the gigantic Pyrenees Mountains is your chance. Admire Spanish nature and gain a new perspective on your vacation, literally. We begin at the landing field where we show you our flying base and its surroundings. 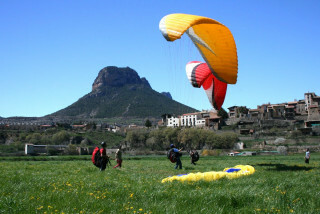 From here, we take you to the Magic Mountain of the Pyrenees, which is one of the best places in the world to paraglide. Going up by car, we gain the necessary 300 meters of elevation in no time. Once we arrive, we tell you all you need to know about the area, the equipment, and the flight itself. The process is easy, and flying is accessible to everyone. All you need to do is run during takeoff, and our top-class pilot will take you safely into the skies. Once in the air, the feeling of flying is indescribable. 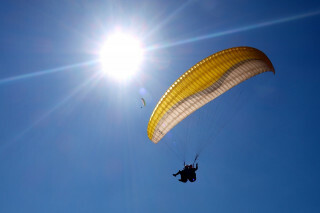 You soar an altitude of more than 1,000 meters. You see the majestic Pyrenees Mountains covered with snow. And you experience the beauty of the landscape from an exclusive viewpoint. 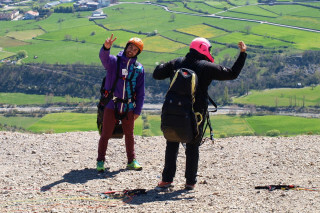 During the flight we take photographs to keep your memories forever, so don’t forget a USB or memory card! We are also ready for families with kids. 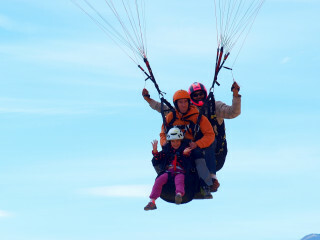 Children older than 3 years can join us in a special family tandem, flying with an instructor and one parent. This special family experience usually leaves the kids speechless, which then leaves us speechless! In case you are looking for more than a discovery flight, just let us know. 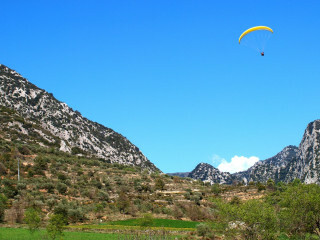 We will happily tell you everything about our options, such as an acrobatic flight, a longer flight session, or a flight further in the mountains. 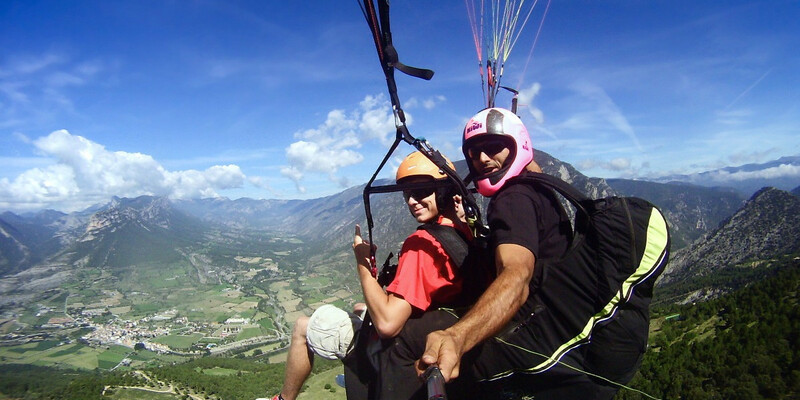 Whichever you choose, you won't forget the first feeling of launching into the sky over the beautiful Pyrenees Mountains.